2013 brings two new, highly technical race suits to the playing field at prices that won't break the bank! Introducing the Motegi and the Orbiter, Alpinestars seeks to provide attainable products that are comfortable to wear and functional to use for the weekend warrior or amateur track day enthusiast. 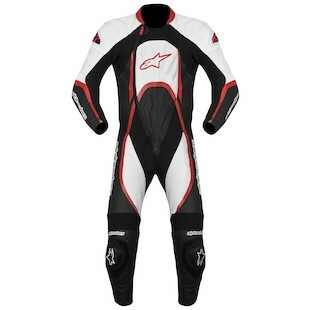 Starting with the Alpinestars Motegi Race Suit, there are several differences that immediately display its progression from last year's Carver suit. Most noticeable perhaps, is the addition of the external hard parts at the shoulder providing extra protection with the TPR inserts. Moving down the body, you will notice more perforation, 'punctuation' (the larger, punched air holes), and an increase in the use of Aramid stretch panels. These stretch panels extend further in important flex zones allowing for better mobility and a more comfortable integration with boots and gloves at the cuffs. The Motegi one-piece is best suited for the occasional track day rider, or weekend warrior. 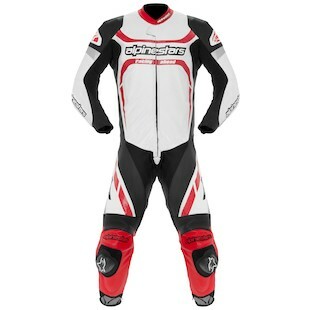 While it does have an aggressive cut, it is not as full-on race shaped as the higher end suits from Alpinestars. Yet, its features still make this suit an aggressive option for those looking to improve their prowess on the track and be comfortable while doing it. Moving up to the Alpinestars Orbiter Race Suit we find some improvements that actually defer to the street rider more than to the track rider. The biggest advantage to the Orbiter is the excellent mobility offered through several means. First, 3D mesh and Aramidic fiber is taken to the next level to ensure temperature regulation and flexibility. Next, the leather paneling and off-set zipper allow this suit to be more comfortable in an upright position for use on the street. For the weekend warrior, who wants the best protection for the street while not sacrificing the ability to take five at a scenic viewpoint or grab a bite at a pit-stop, the Orbiter fills their niche nicely. Its nice to see Alpinestars expanding their horizons and acknowledging the trends in using one-piece suits off the track, however, we appreciate their dedication to keeping these suits every bit capable of a race when needed.